Okay, now that we've stopped drooling and fawning over the cover art for this book we feel it's safe to announce it as this week's pick: So Silver Bright (Theatre Illuminata #3) by Lisa Mantchev. Summary (from Goodreads): Things are never easy for Beatrice Shakespeare Smith. Something's happened to the Théâtre Illuminata, putting the only home she's ever known in limbo. Her mother's sanity is fraying under the strain, her father has vanished and an angry goddess is out for revenge. Bertie is caught between her duties and her dreams, just as her heart is torn between Ariel and Nate. But hope glimmers in a Distant Castle, and if Bertie can put on the performance of her life, maybe she can win the magical boon that may save them all. This is a wonderful series and each cover has been truly outstanding. We can only wonder what Bertie gets into this time around. Can't wait! 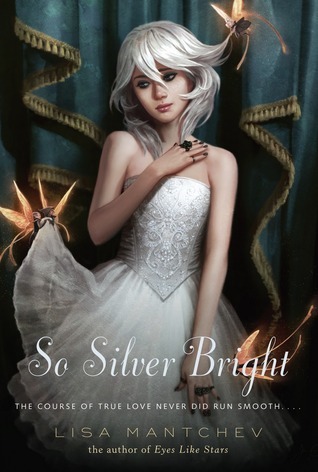 So Silver Bright (hardcover, 320 pages) will be published by Feiwel & Freinds on September 13th. Mark your calendars!